Juan Bernardo Cantu III, who goes by Bernardo Cantu, a recent MFA-Drawing & Painting graduate from The University of North Texas, is featured in edition #90 of New American Paintings, and an artist in the 2011 Texas Biennial. He currently is an adjunct art instructor at University of North Texas in Denton. Bernardo Cantu was born seven miles from the Tex-Mex border in Weslaco,TX. He grow up mainly in South Texas and also lived partially in Washington D.C during the early-mid 80's. His body of work delivers a socially significant message as it explores questions of cultural identity, tears through barriers, stretches limits and creates vast new possibilities. His worked can be viewed as product of a larger decolonizing enterprise, that functions from a mentality of what Walter Mignolo calls border gnosis; knowledge developed at the borderland, that takes form at the margins of the modern Western world. He lives in Denton, Texas. 2010 M.F.A., Painting & Drawing, University of North Texas College of Visual Arts & Design (UNT-CVAD), Denton, TX. 2005 M.S., Texas A&M University-Kingsville (TAMUK), Kingsville, TX. 2001 B.F.A., Texas A&M University-Kingsville (TAMUK), Kingsville, TX. 5OOX Annual Members Show, Dallas, TX. Solo Exhibition, Lone Star Studios, San Antonio TX. Vertigo Art Space, Denver, CO.
Curate. Collaborate: Cura! Cura! Cura!, Group Exhibition, Bath House Cultural Center, Dallas, TX. Summer Group Exhibition, Davis Foundry Gallery, Dallas, TX. 9th Annual Hecho in Dallas, Group Exhibition, Latino Cultural Center, Dallas TX. Active 8: A Mini-Ennial in Texas Art, Group Exhibition, Janette Kennedy Gallery at South Side on Lamar, Dallas, TX. Works by Murielle White & Bernardo Cantu, Cedar Valley Community College Art Gallery, Lancaster, TX. Works by Angelita Rodriguez & Bernardo Cantu, Mountain View Community College, Cliff Gallery, Dallas, TX. 16th Young Latino Artists Exhibition – Thought Cloud, Mexic-Arte Museum, Austin, TX. Curator: Alex Freeman, Education Curator Mexic-Arte Museum. 2011 Texas Biennial, 816 congress building, 5th floor, Austin TX. Curator: Virginia Rutledge, New York-based art historian and art lawyer. Three to Watch - Bernardo Cantu, Yelizaveta Nersesova, Carlo Zinzi”, University of Dallas, Dallas, TX. Curator: Cris Worley, Director of Cris Worley Fine Arts. Annual Faculty Exhibition, Mountain View Community College, Kiva Gallery, Dallas, TX. 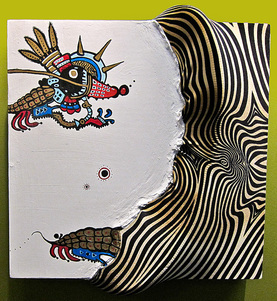 Inter-dimensional Relics from the Barrio 2, Solo Exhibition, 500X Gallery, Dallas, TX. D.O.D.,"Better to die on my feet…", Group Exhibition, Self-Help Graphics, Los Angeles, CA. Curators: Mario Ybarra Jr. and Karla Diaz from Slanguage Studio. Mercantile Coffeehouse (alternative space of The McKinney Avenue Contemporary), Dallas, TX. Annual Faculty and Staff Exhibition, University of North Texas Art Gallery, Denton, TX. Texican Neo-Tribalismo, Solo Exhibition, Eclectic Expressions, Arlington, TX. Interdimesnional Relics from the Barrio, an MFA Thesis Exhibition, Cora Stafford, Denton, TX. 7th Annual Hecho en Dallas, Group Exhibition, Latino Cultural Center, Dallas TX. Jurors: Tomas Bustos, Cristina B. Medina and Gabrielle Castañeda Pruitt. Annual Voertman Student Art Competition Exhibition, University of North Texas Art Gallery, Denton, TX. Art Track 002 Exhibition, Group Exhibition, Cora Stafford Gallery, Denton TX. Juror: John Pomera (Dallas Artist and UTD Associate Professor of Visual Arts). Membership Exhibition 2009, McKinney Avenue Contemporary (The MAC), Dallas TX. Recovery and Reinvention, Selections from Graduate Fine Art, University of North Texas Art Gallery, Denton, TX. University of North Texas Art Galleries. Green 4 Green, Earth Day Exhibition, Group Exhibition, UNT-CVAD, Cora Stafford Gallery- Oak Street Hall, Denton, TX. International Art Exhibit, Group Exhibition, UNT Union Gallery, Denton, TX. Abstract Artists MFA Painting & Drawing Exhibition, University of North Texas Lightwell Gallery, Denton, TX. CAA-MFA, Group Exhibition, Cora Stafford Gallery, Oak Street Hall, Denton, TX. Denton Artists Resource Collaborative (D.A.R.C.) Exhibition, Cora Stafford Gallery, Oak Street Hall, Denton, TX. INNER PLAY: Selections from Graduate Fine Art, University of North Texas Art Gallery, Denton, TX. Curators: Tracee W. Robertson and Victoria DeCuir. Annual Voertman Student Art Competition Exhibition, University of North Texas Art Gallery, Denton,TX. Not to Be Missed by Anyone - Works by Painting and Drawing Graduate students of UNT, 500X Gallery, Dallas, TX. PainTRAP, UNT Graduate Panting and Drawing Exhibition, Cora Stafford Gallery-Oak Street Hall, Denton, TX. New Works by Bernardo Cantu and Norberto Gomez Jr., The Conner Museum, Kingsville, TX. Children of the Third Coast, Group Exhibition, Progresso Art Gallery, Progresso, MX.